Mildly aggresive cleaner rating a 5 on Meguiars scale of 0-10. A paint cleaner sufficient to remove fine defects, including light oxidation, stains, scratches, swirls and fresh water spots. This Cleaner should be used with a foam cutting pad. There is no need to put pad marks in the paint by using a wool pad. Meguiars makes their abrasive materials with "deminishing" abrasives, meaning that they breakdown during use to leave very minimal marks if any. M02 will probably not leave noticable marks if used properly. Work in a slightly smaller area than usual ... say 2' x 2' ... and work it until the liquid is dry and not staying behind on the paint. This will break the abrasives down as far as possible and what's left may not be noticable, however the best finish will be achieved by following with M09, Swirl Mark Remover, a Cleaner/Glaze, on another foam pad. 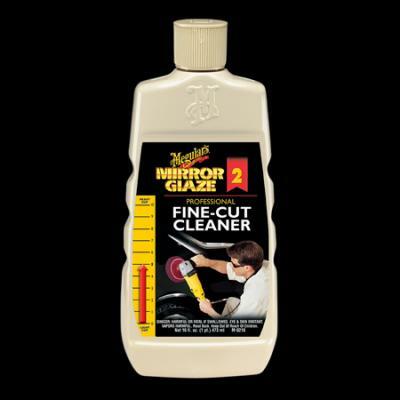 The Doctor recommends using this product when there is plenty of gloss left yet mild oxidaton as well. It's also great for spot imperfections like bumps or marrs. Consider using the clay bar first in case you don't need an abrasive. Available only in a pint (16 ounce) size.